Fitbit (NYSE:FIT) announced four new devices yesterday, including a lower-priced version of its Versa smartwatch, dubbed the Versa Lite Edition. The theme was affordability and the targets were Apple (NASDAQ:AAPL), Samsung and Xiaomi. The market reacted positively to the move, with Fitbit stock closing up 1.86%. The new devices are the Versa Lite Edition smartwatch, the Inspire and Inspire HR fitness trackers and the Ace 2 fitness bands for kids. Fitbit watchers will notice that all of these names are familiar — even though two of the new products have never been released to the public. The marquee release is the Fitbit Versa Lite Edition. This is a smartwatch based on the popular Fitbit Versa, minus a few features, offering bright new colors, and selling for $40 less. At $159.95, the Versa Lite Edition has the key features of the Versa, including 4+ day battery life, continuous heart monitoring, female health tracking, activity and sleep tracking, and notifications. It’s also compatible with Versa apps, watch faces and accessories such as watch straps. The new colors are Marina Blue, Mulberry, Lilac and White. What does it lack compared to the more expensive original? The Versa Lite’s interface is driven by a single button instead of three, it lacks NFC for Fitbit Pay, there is no onboard music storage and it can’t track more advanced activities like swimming. Fitbit has clawed its way back from some dark times based on sales of the Versa. The company sold an estimated 2.3 million smartwatches in Q4 and was the world’s second largest vendor of smartwatches in 2018. The cheapest Apple Watch Series 4 starts at $399, and Samsung’s new Galaxy Watch Active is priced at $199.99, so the Fitbit Versa Lite is positioned to continue driving sales to budget-conscious smartwatch shoppers. The pressure is on to pick up the consumers who don’t want a smartwatch — either because of cost or because they don’t want the size, extra features or constant battery charging. Xiaomi has been giving Fitbit a tough battle with cheap trackers like its Mi Band, and Samsung is getting into the game with the $99 Galaxy Fit and even lower priced Galaxy Fit e-fitness bands. Fitbit already has the Inspire and Inspire HR, so why not release them to the public? At $69.95 $99.95 respectively they have the features most people want including 5-day battery life, sleep and fitness tracking, a water resistant design, touchscreen display and smartphone notifications. The Inspire HR also offers connected GPS functionality, constant heart rate monitoring and goal-based exercise modes. The company also announced the Ace 2, a $69.95 followup to its Ace fitness tracker for kids. It gets a price cut from the original, a bigger protective bumper and is marketed at children aged six and up. While it wasn’t mentioned in the press release, after the announcement the Alta, Alta HR, Flex 2 and Zip trackers disappeared from Fitbit’s website. Look for the new Fitbit Versa Lite Edition, Inspire and Inspire HR, and Ace 2 to land in stores later this month, with the Versa Lite currently available for pre-order. 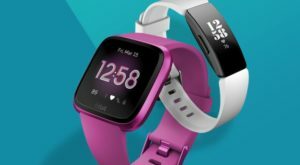 Article printed from InvestorPlace Media, https://investorplace.com/2019/03/fitbit-releases-4-new-low-cost-devices-including-versa-lite/.